Keeping high standards of quality in mind, we design Hydraulic Hand Stacker from premium grade material and components, which lends them quality, longer service life and functional effectiveness. 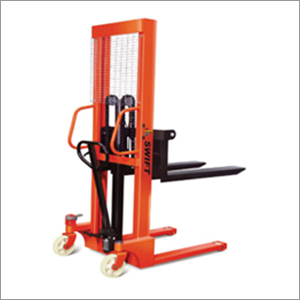 We have with us a team of proficient engineers, who works hard to satisfy needs of our clients through regular as well as customized range of hydraulic stacker designed as per their specific application needs. As the eminent manufacturer in the industry, we ensure simple operation, compact design, noiseless operation, and versatile design of the equipment. Its surface is polished / hard chromed, which provides good resistance to wear, rust, and scratches. Its hydraulic system is assured to have long life via top grade and double sealed oil seals. Light and compact design of hydraulic hand stacker ascertains least operator fatigue and trimmed pulling power. The wheels provided are of cast iron, nylon, and polyurethane. It can pick the drums vertically and coney them to the destination.